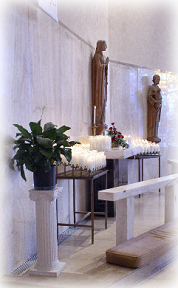 The tasteful and appropriate arrangement and decoration of the church and sanctuary according to the church’s liturgical guidelines, is an important help to providing an uplifting and prayerful celebration of the liturgy. To achieve this, a core of persons meet to plan and decorate the church and sanctuary, especially for the seasons of Christmas and Easter. The person overseeing the art and environment of the church also serves as a member of the Worship Committee. Anyone is welcome to join the group, or to simply help with decorating, especially for Christmas and Easter.